Nursery children and staff thrilled with these. Take the class outside and explore the magic of art with our Jumbo Playground Chalks. Providing a non-permanent choice of medium, each of these chalks is supplied in a large and chubby design which fits easily into the hands of younger artists. The high quality chalk used minimises excess dust - perfect for both extending the lifetime of your pack and minimising dirt on clothing. Encourage children to choose from an assortment of pastel colours and create the most engaging pieces of art on floors or walls before simply allowing water or rain to sweep it away. 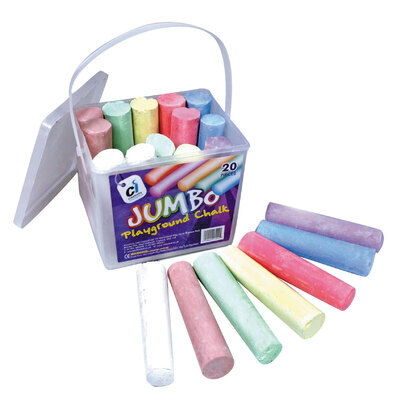 This pack of 20 playground chalks are supplied in a durable plastic case with clip down lip and transportable handle. Our Playground chalks are also available in a 52 pack for larger nurseries or classes. For added protection, why not opt for our Children's Smocks and keep their clothes as covered as possible?